Yesterday afternoon we told you about a killer sale that popped up on Amazon. 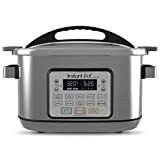 The $160 Instant Pot 8 Qt Aura Pro Multi-Use Programmable Multicooker with Sous Vide is the only multi-use cooker that Instant Pot makes with a built-in sous vide function, and it almost never goes on sale. Thanks to a $32 clippable coupon on Amazon, it dropped to an all-time low of $127.99. Last time this coupon popped up on Amazon it sold out within about an hour, but today we have some terrific news: it’s somehow still available! Hurry up and head to the Amazon page now and you’ll still find that $32 coupon there. We have no idea how much longer this deal will last though, so you should definitely take advantage as soon as you can.